What should the Democratic Party fear more -- Joe Biden in the race or Joe Biden not in the race? The former vice president's campaign rationale is predicated on the assumption Democrats need him. His maturity, pragmatism and centrist inclinations are the way to win back the kinds of voters who flipped to President Donald Trump -- or so the argument goes. 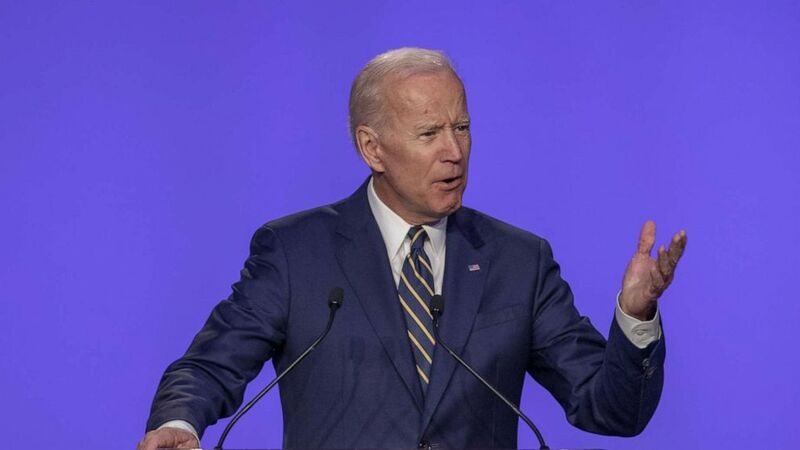 (Tasos Katopodis/Getty Images) Former Vice President Joe Biden speaks at the International Brotherhood of Electrical Workers Construction and Maintenance conference, April 5, 2019, in Washington, D.C. Yet seeming to joke about issues he needs to take seriously may be the beginning of the challenges facing Biden, should he make good on a run that appears increasingly likely. Biden on Friday called himself an "Obama-Biden Democrat," a phrase we'll hear regularly if he declares his candidacy. But the composition of the Democratic Party and the country have changed substantially even since the Obama-Biden era, as Biden knows even while arguing that the "party has not moved." Former President Barack Obama himself fretted about the emerging dynamic over the weekend. During an appearance in Berlin, he said that progressives' "rigidity" on some issues could create a "circular firing squad" for Democrats. The circling hasn't waited on Biden's decision. A delayed announcement has allowed others to start defining both the 2020 race and Biden himself. Trump wants a new Secretary of Homeland Security. He abruptly announced on Twitter Sunday evening that Kirstjen Nielsen would be leaving her post and be replaced Kevin McAleenan, the current U.S. Customs and Border Protection commissioner. The president has been eager for results and expressed a desire to cause a traffic headache and slow down commerce, according to his tweets over the weekend. He doubled-down on a plan to send additional border agents to southern ports of entry to assist with processing people crossing from Mexico. 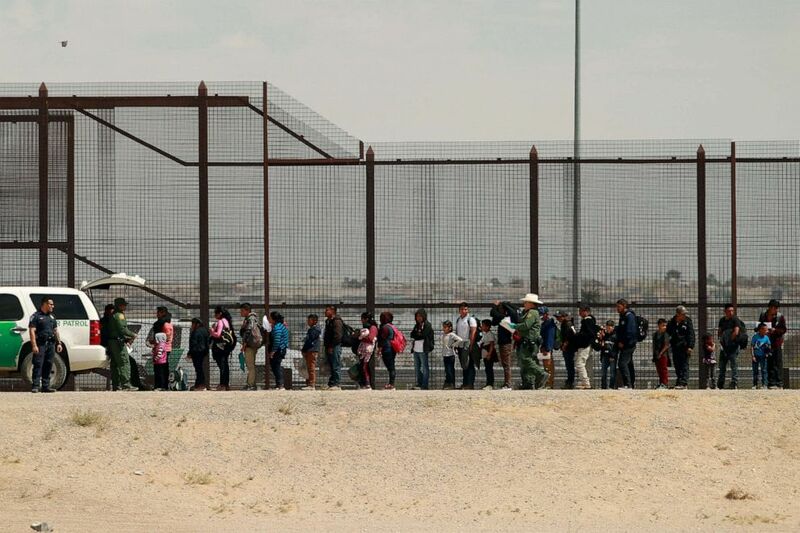 (Jose Luis Gonzalez/Reuters) Migrants queue as they listen to U.S. Customs and Border Protection (CBP) officials after crossing illegally into the United States to request asylum, in El Paso, Texas, April 5, 2019. "This will cause traffic & commercial delays until such time as Mexico is able to use.... it's powerful common sense Immigration Laws to stop illegals from coming through Mexico," he wrote in a series of tweets. Saturday, the president made fun of Central Americans seeking asylum in the United States, calling the program a "scam." Still, government officials, members of Congress and experts on the border have documented the desperation of people fleeing poverty, violence and gangs in Central America as well as a double-digit increase of families with children in particular reaching the U.S.-Mexico border and seeking refuge. Last week, the only Hispanic Democrat to enter the crowded presidential primary so far, former Mayor and Housing Secretary Julian Castro, released a detailed immigration proposal that will surely challenge others in the race from his party to do the same. The president is expected to keep up the drum beat on the issue this week on a planned trip to Texas. (Alex Edelman/Getty Images) Eric Swalwell (D-CA) speaks during a news conference regarding the separation of immigrant children at the U.S. Capitol, July 10, 2018. In 2018, amid a string of horrific mass shootings, Democrats across the country were unafraid to make gun control a more prominent part of their platforms. 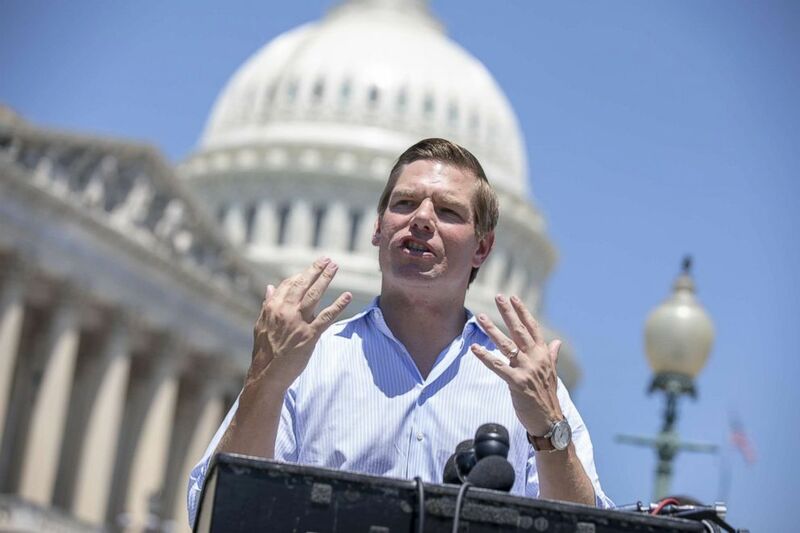 Now we may be poised to see a candidate attempt to do the same on a national stage, as Rep. Eric Swalwell, D-Calif., is rumored to be joining the presidential race on Monday. The congressman is making an appearance on "The Late Show with Stephen Colbert" Monday evening and on Tuesday will hold a town hall on ending gun violence in the same community that saw 17 people killed during a mass shooting at Marjory Stoneman Douglas High School in Parkland, Florida. If Swalwell does enter the presidential race, it would be a key test of how broadly a candidate focused on the issue of gun control could appeal in a crowded Democratic primary. ABC News' "Start Here" podcast. Monday morning's episode features ABC News White House correspondent Tara Palmeri, who tells us why Department of Homeland Secretary Kirstjen Nielsen is out of a job despite Trump's renewed focus on border security. And ABC News' Clayton Sandell brings us the story of a legal immigrant denied U.S. citizenship because of his career in the cannabis industry. President Donald Trump will attend a credentialing ceremony for new ambassadors at 11:45 a.m., then eat lunch with the vice president, then attend an intelligence briefing at 1:45 p.m., then meet with the secretary of state at 2:30 p.m.
Sen. Michael Bennet, D-Colo., wraps up his weekend visit to New Hampshire and then participates in a meet-and-greet with Polk County Democrats in Iowa, as he considers running for president. Presidential candidate and Miramar, Florida, Mayor Wayne Messam will participate in several events in South Carolina. Presidential candidates Sens. Amy Klobuchar, D-Minn., and Bernie Sanders, I-Vt., will participate in the International Association of Machinists and Aerospace Workers member-driven 2020 presidential election endorsement process in Las Vegas. Rep. Eric Swalwell, D-Calif., will appear on "The Late Show with Stephen Colbert." South Bend, Indiana, Mayor Pete Buttigieg will make two stops in Las Vegas for the first time since announcing his exploratory committee. He will speak with voters at a meet-and-greet event and veterans at Veterans Village. Download the ABC News app and select "The Note" as an item of interest to receive the day's sharpest political analysis every week day.